As a house settles, doors that used to open and shut smoothly start sticking. And, sometimes the door falls so far out of alignment that strike plate no longer catches the door latch. So, how can this be fixed? Well, adjusting the strike plate is not the answer. First, look at where the latch is hitting the strike plate. Is the latch passing above or below the hole in the strike plate? This tells you which door hinge you have to adjust to rotate the door. In my case, the latch was passing above the hole in the strike plate. To correct this, I needed to push down top of latch-side of the door down so that the hole in the strike plate would catch the latch again. To rotate the door in that direction, I needed to push out the top door hinge a bit. Originally, the door hinge was flush with the door jamb. However, I loosened the screws holding the hinge to the door jamb, placed a piece of cardboard behind the hinge, traced the outline of the hinge with a pencil, and then cut the cardboard to obtain a pad. With the pad, I placed it under the hinge, and tightened the screws. So, in the photo, the top hinge now sits a bit off the door jamb. 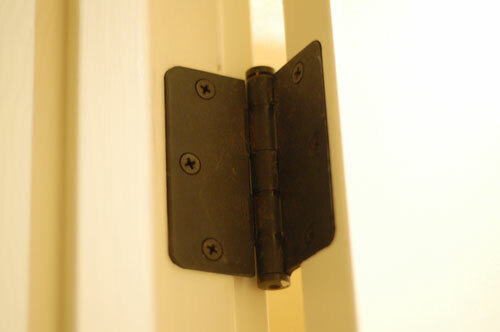 However, this slight adjustment was just enough to push down latch such that it now catches whenever the door is shut.